It did not take long for the handy Danigree to find winning form this campaign, the six-year-old at just his second start this time in proving too strong for his rivals at Warracknabeal on Saturday. Somewhat unlucky having missed the start when resuming at Warrnambool early last month (forced wide in a race run to suit the on-pacers), Danigree had things go better for him this time around and as a short priced favourite was always travelling well for Linda Meech. "There was a bit more pace on today," Mitchell said, "and he enjoyed that solid speed as well as a bit of give in the ground." 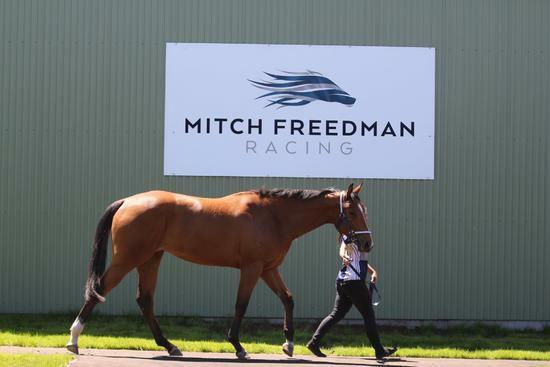 "We kept him up to the mark with a trial at Cranbourne in between runs and it was good to get him up to his preferred distance of 1200m... and he was well handled by Linda Meech." It was win number five from 24 starts for the consistent galloper who wins a race every preparation. A son of the reliable stallion Danerich, Danigree is out of the three times winning Gilded Time mare Filigree who was served last spring by Tasmanian based Doomben Cup winner Mawingo. A daughter of the metropolitan winner Thredbo, she is a descendant of the VRC Oaks and Derby winner Frances Tressady who has a Flemington Group Three raced named in her honour.